Our conception of time as moving in one direction, from past to present to future, is so commonplace that we accept it as fact. But what if our experience of time is misleading us, and perhaps hiding the true reality of the universe? Can we rely on our senses to accurately perceive something as abstract as time? Is time real, or just an illusion caused by other physical effects? Can science provide any clues into understanding time? It was once thought that time existed as absolute and unchanging, flowing at a constant rate and moving in one direction. This was true for scientists and the public alike. Isaac Newton considered time in much the same way as space; time and space providing the arena in which the universe unfolds. Newton’s famous laws of gravity and motion assumed absolute space and time. His laws work extremely well for our corner of the universe, that which is accessible to human senses. They are still used today to calculate the gravitational forces of the sun, moon and planets, as well as the motion of spacecrafts and objects close to earth. There is a catch, however; Newton’s laws are not 100% accurate. Absolute space and time is not an acceptable assumption when dealing with extreme scales of the universe, a reality that was hidden from Newton in his time. The modern laws of physics question our everyday concept of time. In the early 1900s, Einstein devised the theories of special relativity and general relativity, and the idea that space and time could be flexible was born. More than 300 years ago Isaac Newton wrote that, “He did not need to define time because it is something well known to all.” For obvious reasons our common sense perception of time has been called Newtonian time. The concept of absolute time had gone unchallenged until Einstein came along. With Einstein’s revision of Newton’s ideas we have to envision a universe where each celestial body and each observer (what concerns us) carries their own clock with them. With relativity, the passage of time is relative to influences of mass and motion. In short, massive objects like stars and planets cause space and time to warp, resulting in gravitational effects and slowing down time. Also, time elapses slower for an object in motion than for an object at rest; the discrepancy in the passage of time gets proportionally larger as the speed increases. Even though it can be said that time runs at different rates (or two observers disagree on the passage of time), each perspective is equally valid. When one observer moves relative to another observer, clocks will not agree. Flexible time is a property that applies everywhere in universe, however, the effects are minuscule in everyday life. Although the effects of relativity are not visibly apparent to us, observations have confirmed that this is how the universe really works. The scientific evidence is conclusive; time is relative, not absolute. Just as one can move through space, one can also move through time. No longer could space and time be considered as two separate entities; a new term called spacetime was brought into use to better account for the relationship between the two. A hypothetical situation of an alien in a distant galaxy shows how bizarre relative time can be. If you are stationary here on earth and the alien moves away from you, the alien’s now coincides with a moment in your past. If the alien turns around and moves towards you, then the alien’s now coincides with a moment in your future. Just as extremes in speed and gravity alter the passage of time, extreme distance has a similar effect on what constitutes a given moment of time for two observers. This is the kind of universe that Einstein described. I cannot think of a better everyday example of flexible time than GPS devices. The clocks in the satellites in orbit need to account for the fact that clocks on the Earth run a little bit slower. This is due to the combined effects of the motion of the satellites and the gravity on earth (the Earth’s gravity having the largest effect). If not for the application of relativity, GPS devices would quickly become inaccurate. Whether we examine small physical systems or the universe as a whole, there is no arrow of time found in the laws of physics. For example, if a scientist knows all the current conditions, he can determine precisely what happened in the past or predict a future outcome. This can be achieved by applying the same laws either backward or forward in time. Is there anything in science that indicates an arrow of time? There is a concept in physics called entropy, which may give us an arrow of time. Simply stated, entropy is the measure of disorder, and the implication of entropy is that physical systems move towards a direction of increasing disorder. The reason being, that there are many ways in which disorder can come about. Conversely, there are few ways that order can be achieved. Let’s take the example of the pages of a book (all numbered in order). If we were to randomly mix up the pages (and re-stack them) the chances are extremely high that the pages will end up disordered. In only one configuration will the pages be ordered, while many arrangements will be disordered. In almost all cases it takes a special effort to create order and no effort at all to create disorder. The puzzle is: how has the universe created stars, galaxies, planets and life on earth? If entropy rules, you would think that the universe would be in chaos forever. To get an answer we may have to go back to the birth of the universe. The Big Bang is believed to have been a highly ordered event (perhaps the most ordered state of the universe). From that point on the universe has evolved into greater disorder. Entropy may give us an arrow of time. From the point of most order (in the past) towards increasing disorder (in the future). This should make us pause and consider our present conditions on earth. Conditions favorable for life are extremely difficult to come by, and entropy is bound to rule in the end. In the grand scales of the universe, in both time and space, life is a newcomer and rare (as far as we know). Life on earth is destined to be extinguished, at least at some time in the far future. Our experience shows us that many things only happen in one direction, and usually in the direction of more disorder. For example: A glass can fall to the ground and break, but a glass can’t reassemble by itself. A drop of ink can mix in water, but the ink can’t come back together into a drop. An egg can be broken, but can’t reassemble back into the shell. This is entropy at work, and possibly the scientific reason behind our common-sense experience of an arrow of time. Clearly, there is a sense that time moves from past to present to future, like a river, which flows in one direction from one moment to another. From the present perspective the past is gone forever and the future is yet to be realized. However, for physicists it is not as clear cut. From Einstein’s perspective, what constitutes a given moment of time is dependent on the observer. Because time is relative to each observer, my now could coincide with a past or future experience of someone else in a far-away galaxy. There is no sense that the whole universe progresses at the same rate. There is no now that everyone can agree on. Does time really flow like a river? Even from a common sense perspective the distinction of past, present and future is relative to the individual. For me, someone who lived many years ago existed in the past. Someone that will live 100 years from now will exist in the future. That’s all from my perceptive or from my point of reference. From the perspective of a historical figure, like Einstein, he lives in the present and I will exist only in the future. With each moment there is no essential difference, no temporal absolute, just the relative perspective of each individual. If I haven’t created enough doubt as to your assumed notion of time, I will conclude with one more observation. This has to do with change. Is it possible that the only real aspect of time is change? At least could change be the only way that time is perceived? We notice time has elapsed because something has changed. It is reinforced by our mind. Our memories tell us that an event was in the past, and our imagination projects that something could happen in the future. In essence, we experience the passage of time or that time flows because of continual change. If there were no change at all, would time even exist? Imagine a universe with every object being still or no objects at all. Every moment would be identical. A reality with no change is not our experience, nor is it how the universe presently works. However, a particular question about the Big Bang Theory may shed some light: That is, what happened before the bang? Science can’t take us back any further, as the Big Bang represents a theoretical barrier. Perhaps we don’t need to look further. Physicists believe that time and space as we know it were created at the Big Bang. This may be highly speculative, yet it could be that there was no change before the Big Bang; or conditions were so chaotic that there would have been no discernible events. Thus, that would mean that nothing really happened before. At the other end of the spectrum, one current model of the universe predicts that space will continue to expand at an increasing rate. This expansion will drag every galaxy farther apart with no end in sight. Far, far into the future everything in the universe will become diluted. In the end, if we can call it that, everything will decay, leaving only random particles drifting in space. The universe will be cold, dark and practically empty. We could even conclude there will be no change and time will also come to an end. Coming up with an explanation for time is challenging. You could even make a case that time does not exist. What we experience as time may be something else altogether. With each perspective of time I have mentioned there is something intriguing, and still something seems to be missing. How could something as familiar as time be explained differently, with each explanation having some merit? That’s how it appears to me. Newtonian time aligns very well with our daily experience of time. Einstein’s relativity is in agreement with modern observations of the universe. Entropy gives us an arrow of time not found in the laws of physics. The river of time points to everyone’s unique frame of reference. And finally, change gives us a physical component that marks the passage of time. References: Brian R. Greene, The Fabric of the Cosmos (New York: Alfred A. Knopf, 2004), 139. The Fabric of the Cosmos: The Illusion of Time, Life Sciences, Published on Apr 12, 2016. https://www.youtube.com/watch?v=pPA83Ap0Xsg. Of course we all know what gravity is. It’s the force responsible for making objects fall, keeping our feet firmly planting on the ground, and maintaining the moon’s orbit around the earth. But by what mechanism does gravity accomplish these tasks? Surely there are no invisible strings of a master puppeteer. The full story behind understanding the force of gravity spans at least 400 years. Three giant steps have led to modern physics’ current picture. Just before he died, in 1543, Nicolaus Copernicus published his famous work describing the heliocentric model of the universe. Although he had formulated his theory years earlier, he delayed publishing until the end of his life. This was probably because he feared criticism from contemporaries or retribution from the church. Placing the sun at the center of the known universe (as opposed to the earth) was a revolutionary idea for its time. This was a monumental leap in the early scientific age. The idea that the earth moved went against common sense and intuition. In reality, whether the sun moved or the earth moved could not be determined by visual means. Sometimes science has to rely on other methods; in this case, the daily/monthly movements of the planets had to be charted and analyzed. An object can only be said to be in motion in reference to something else. For example, if you are on a boat that is departing from a large dock, and you look to your side, you will see the dock moving. For an instant you will think that the dock is moving. Then you realize this can’t be true. You may feel the boat rocking or accelerating, but from a visual point of view you can’t tell which is moving. Years later, Galileo adamantly supported Copernicus’ view and took the brunt of the attack from the church. He was sentenced to house arrest, where he spent the last decade of his life. Nevertheless, Galileo’s contribution to science extended much further than the celestial model. He was instrumental in establishing observation and experimentation as pillars of scientific reasoning. It was becoming clearly that there was order and predictability in nature, which was accessible to human analysis. Johannes Kepler also lived in Galileo’s time, and he was able to calculate the motion of the planets using mathematics. His most famous work is known as the laws of planetary motion, a precursor to Newton’s laws. In the process he calculated that the orbits of the planets were not perfect circles as originally thought. But rather moved in elongated circles called ellipses. Although the movement of the celestial bodies were being charted in great detail, there was still no comprehensive theory of gravity. Isaac Newton imagined a cannon perched on a mountain top and asked himself the following question: what would happen if cannon balls were fired at steadily increasing speeds? The first few balls would start out in a straight line and then fall to the earth in a curved trajectory. However, if he kept going, something peculiar would happen. The curved path of the cannon ball would eventually match the curvature of the earth. The cannon ball would be in perpetual free fall, and orbiting the earth. This was the key insight. The same force that was responsible for maintaining the orbits of the moon and planets also caused an apple to fall from a tree. No one had thought of this before. At least if someone had, it did not become public knowledge. Therefore, the story that Newton got his idea of gravity when an apple fell on his head may not be true. He could have been thinking about cannon balls. But having a cannon ball fall on his head does not make for an inspiring story. What followed was a mathematical unity of both the heavens and earth, his laws of motion and universal gravitation. In spite of Newton’s great achievements, he still had no clue what gravity actually was. It would take more than 200 years for someone to come up with the answer. Among many things, Albert Einstein was famous for his thought experiments. He imagined physical scenarios, which he tried to figure out what would happen and how it could be explained. Perhaps this is how he came up with his picture of gravity. In 1915, ten years after his theory of special relativity, he published the theory of general relativity. As it relates to the actual cause of gravity, the answer is as counter intuitive as the earth moving through space. 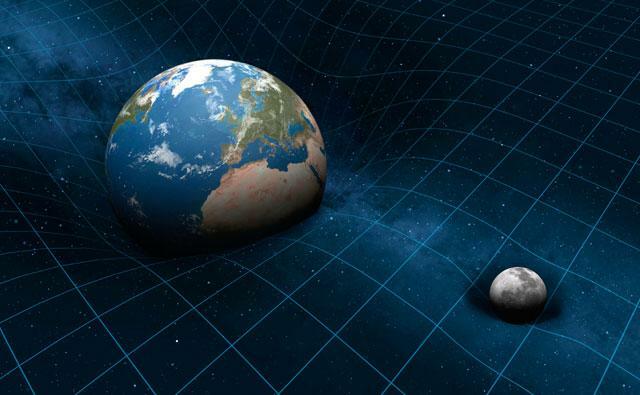 The gravitational effects are caused by the properties of space itself; just as Einstein had shown that time was flexible (in special relativity), space was also flexible. It is the warping or curving of the fabric of space that make objects fall and maintain the orbits of celestial bodies. It is similar to the effect of a large rubber sheet (like a trampoline). If one were to place a large heavy ball at the center of the sheet, any smaller balls would be drawn to it by the warping of the sheet (caused by the heavy ball). Orbits will be created when a balance is established between the motion of a body and the distortion of the spatial fabric. That’s it, distortions in space caused by massive bodies, not a pull or push is responsible for gravity. This theory goes beyond Einstein’s imagination; it has been confirmed by scientific observations. It took 400 years of investigation to understand the basic property of one of the most familiar forces on earth.